Ruched black velvet with ribbon gimp. Made in the USA of imported rayon/silk. 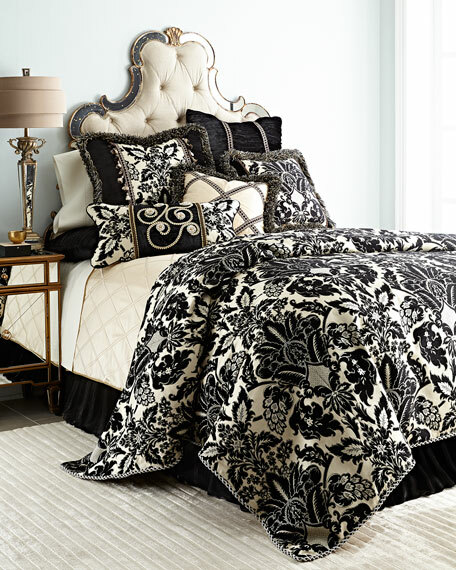 EXCLUSIVELY AT NEIMAN MARCUS Sham with lace overlay. Front and back: polyester. Zip closure. Dry clean. 25"Sq. Made in the USA of imported materials. EXCLUSIVELY AT NEIMAN MARCUS Ruched silk sham with braid accents. Twisted cord finish. Back: polyester. Dry clean. 25"Sq. Made in the USA of imported materials. EXCLUSIVELY AT NEIMAN MARCUS Ruched silk sham featuring rhinestone trim. Hidden zip closure. Front, silk. Back, polyester. 25"Sq. Dry clean. EXCLUSIVELY AT NEIMAN MARCUS Ruched silk sham featuring rhinestone trim. Hidden zip closure. Front, silk. Back, polyester. 25"Sq. Dry clean. Made in the USA of imported materials.